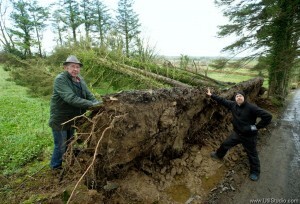 THE Frawleys of Derryguihy, which translates to the Stormy Oak Wood, saw the townland live up to its name when their hay barn was lifted and carried over the family home, at the height of a storm on Wednesday of last week. The barn roof travelled 60 feet from its original location and miraculously only caused damage to five slates on the roof of Brendan and Patricia Frawley’s home in Kilmurry McMahon. They were at home at the time of the phenomenon, which the family has labelled “a tornado”. 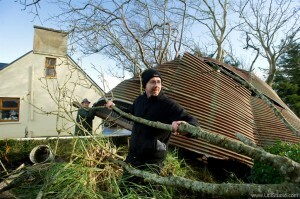 Ivor Frawley, Brendan and Patricia’s son, who has a garage next to the family home, spoke about what he witnessed during the peak of the storm. “I was working in the garage. The storm just got ferocious all of a sudden. The intensity and the rain; I never saw anything like it. It was like a tornado for a minute at the height of the storm. The door was closed but I saw two bonnets that I had out to one side, with a tyre left on them; they took flight. They were old bonnets that I had just removed and I had old tyres on top of them and they lifted about four or five feet and then just took off like a spaceship. The garage door was closed so I didn’t see the hay shed and I had a peek out the door to see if I could see the bonnets because I had cars in the yard that I thought they might be damaged,” he said. Having witnessed the bonnets take flight, Ivor looked out the door to see if there was anything else flying around and whatever way he looked he saw the hay barn was gone. “I looked out and I saw no sign of it. The wind was going in one direction and where the shed landed was in a different direction to where the wind was blowing. It went 60 feet from where it was and it cleared the house. We didn’t hear it or anything with the noise of the storm. There were three sections, one section was maybe 10 feet from where it originally was and another cleared the house and landed at the gable end of the house and broke some slates. It was just lucky because if it was ten feet shorter it would have come down on the house,” he said. Ivor said both he and his parents heard “a kind of a bang” but thought it was thunder. They know now that it was the slates breaking on the roof. 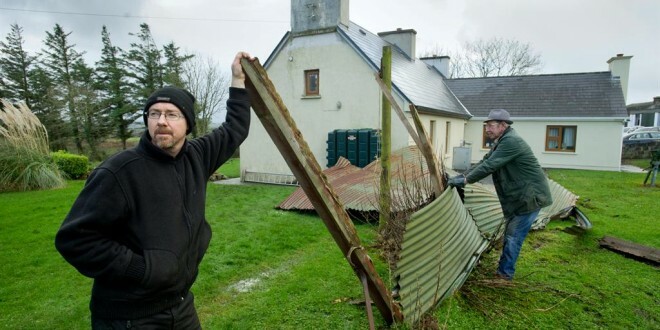 “It has to be a tornado and the shed is intact, it didn’t take any sheets, the framework and the timber is still on the shed, and there was no loose sheeting. It was amazing. The house was only roofed last year. We were lucky no one was injured because it could have been very serious. The yard is all debris. Six trees were knocked. I came out to the house before that, but I’d say if I had come out of the garage during it, it would have taken you if you were in it, it was just unreal and the way it was pushing the rain. It was only about half a minute but it was intense. I knew it was savage from the skies but you couldn’t look out the window with the way the rain was hitting it,” he said. Meanwhile, a search for the bonnets that had taken flight wasn’t entirely successful. “We found one, but we don’t know where the other is and it will be hard finding. It will it be interesting to see where it did end up,” he said. Ivor said that the damage seemed to have been confined to just their particular location. It also appears that the tornado might have been a blessing in disguise as Ivor said they mightn’t bother putting the hay barn up again. “It was blocking the view out of the house and it was there 60 years. We will have a whole new aspect because it’s gone and has opened it all up there. It was an eyesore so we might build a new one,” he concluded.